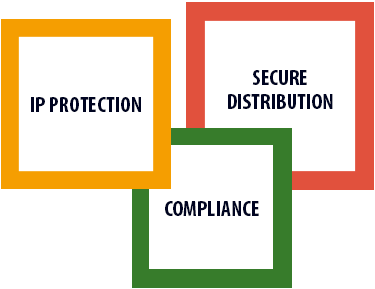 assetSERV’s DAM-DRM axis offers organizations an all-encompassing solution to securely manage its digital assets, and protect and administer user rights – all at a single place through one unified source . The solution automatically clears the usage of assets in real-time, in compliance with the digital IP terms and helps organizations quickly monetize their solution offering. The approach to rights management has shifted from controlling access to proprietary content to focusing on available approaches and tools to manage and track the IP rights associated with digital assets. Digital Rights Management (DRM) enables organizations to maximize revenue and reduce cost through efficient management of IP Rights. assetSERV’s DRM solution helps lower operational costs as organizations spend lesser effort in determining asset rights before they put enforcement rules in place. assetSERV’s DRM module assists organizations systematize business processes which in turn helps them leverage intellectual property in a more enhanced manner. Our DRM offering allows you to leverage the power of improved analytics with customized reports allowing end users to determine the utilization efficiency of their assets. Cognizant helps organizations accrue, recognize, and report augmented revenues due to real-time availability of rights information.